Editor’s note: This is a story that appears in the winter 2014 print edition of Gateway Journalism Review. 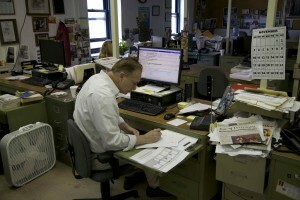 I fell in love with the Alton Telegraph newsroom. 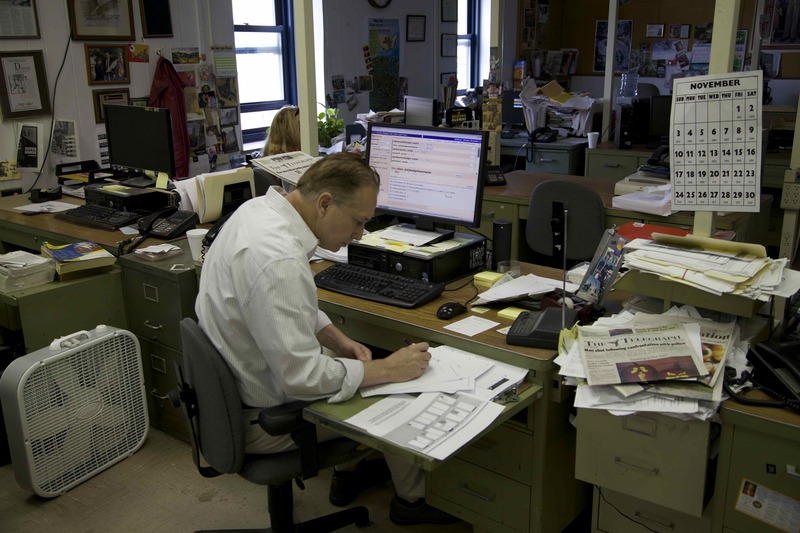 Who wouldn’t, with its dangling cables, stacks of yellowing newsprint, reference books – that’s right, BOOKS – on cabinets with wheels and reporters’ desks adorned with the bric-a-brac from years of school-board meetings, election nights and city council debates? Founded in 1836, the Telegraph would watch journalistic history come to this Mississippi River town. Abolitionist Elijah Lovejoy moved his newspaper from St. Louis to Alton, where he expected less opposition to his views. Instead, he and his Alton Observer became targets and he was slain by a mob of anti-abolitionists. Today’s Telegraph editor, Dan Brannan, seated at his desk, let me wander for an hour to take these photographs. I couldn’t help but feel the Telegraph’s struggle to survive. Now owned by Civitas, its news staff has dwindled to a handful and its print circulation has declined. Whatever the future holds, newsrooms like this have an ambience not found in the more sanitized digital-news offices of today. Their struggles to survive make their gun-metal gray furniture and abandoned Styrofoam coffee cups all the more appealing – at least to anyone who once sat at desks like these, wheeled backward on squeaky chairs and fiddled with a tangled phone chord while scribbling notes for the next day’s story.